Two thousand years ago Aristotle wrote that cells lining blood vessels determine organs. Recently, he was found correct when capillary cells demonstrated elaborate communication with stem cells and many other cells. 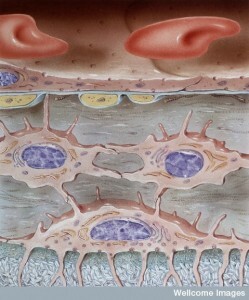 Unique capillary cells in each organ have dramatic effects on the life of the cells in that region. With elaborate communication between immune and blood cells, tissue stem cells and neurons, they are the brains of the local region. Now, another cell, called pericyte that surrounds capillaries is found to be a major player in all communication and decision-making, including in the brain. 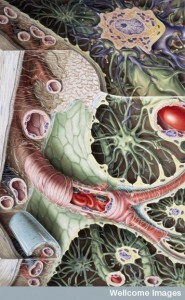 Pericytes that surround small blood vessels have elaborate communication with capillaries. 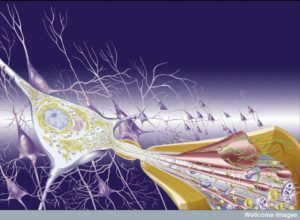 In the brain, pericytes are part of a unique unit (neurovascular unit or NVU), which signals between neurons, other glia and immune cells. 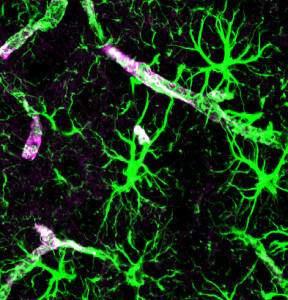 Pericytes appear to be the most significant factor in keeping the blood brain barrier secure. They also monitor and regulate blood flow in the brain along with astrocytes. Measurement of this blood flow is what is used for fMRI measurements (not neuronal activity). Blood flow is assumed to correlate with neuronal activity, but doesn’t exactly. This post will describe the recently discovered elaborate communication of pericytes with capillary cells, astrocytes and neurons. Pericytes can contract like muscle cells around blood vessels. 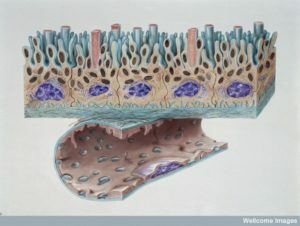 They wrap around all small blood vessels in the body embedded in the strong basement membrane. They are especially important in the brain for monitoring the blood brain barrier. They signal to capillary cells by direct contact and with secreted molecules. Pericytes are influential in stimulating new capillary and other blood vessel cells. Pericytes can travel through the body like blood cells, contract like muscles, survive apoptosis signals and become stem cells. They also form new blood vessel branches. They can eat debris, like phagocytes. Their lineage is in question since they have similarities with so many other types of cells—neurons, smooth muscles, glia, adipocytes, fibroblasts, and stem cells. With these many unusual properties, some consider them relatives of microglia. Pericytes protect capillaries from toxic signals and send signals that stimulate more blood vessels. They secrete Bcl for survival of capillaries. 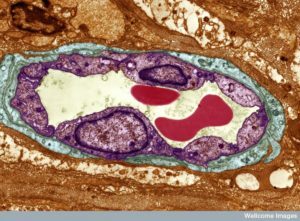 A unique structure in the brain called the neurovascular unit combines lining cells such as capillaries, pericytes wrapping around capillaries, astrocytes that wrap on top of pericytes, and of course, neurons. Of all of these cells, pericytes are most in charge of the permeability of the blood brain barrier. They are also very significant, along with astrocytes, in controlling blood flow. Pericytes signal to help stabilize and monitor the production of capillary cells. They can also become stem cells and then muscles. Pericytes are right in the middle of the NVU and play a leadership role. They receive a large amount of signals from astrocytes, microglia and oligodendrocytes as well as vessel cells and the neurons. Pericytes look different than capillary cells because of a round nucleus (capillaries have a flat nucleus). Pericytes have fingers like astrocytes that wrap around vessels. Capillaries and pericytes share basement membrane where integrin molecules connect them and help communication (as well as fibronectin, N-cadherin, and connexin). These molecules connect with actin scaffolding inside the cells. They can interlock with other cells, looking similar to gears where gap junction synapses share ions, molecules and electricity. Capillary cells and pericytes are very interconnected and failure of one leads to failure of the other. For the blood brain barrier, pericytes form tight junctions and use vesicles to communicate with capillaries. They also inhibit immune cells that could damage the blood brain barrier. There are many signal pathways between pericytes and capillaries, astrocytes, and neurons. TGF signals help pericytes differentiate. A signal from capillaries calls for pericytes to migrate to their particular blood vessel. Another signal, SiP, helps this process also. Angiopoietin 1 and Tie-2 signals are needed for capillary survival. Pericytes are embedded in the basement membranes below capillary cells in the smallest blood vessels. Very small blood vessels make up 90% of all blood vessels and are the location of all of the action related to feeding of tissue and oxygen carbon dioxide exchange. Pericytes have processes they put out along the outside of capillaries, but they also protect small arterioles and venules, vessels that are one one size larger than capillaries. 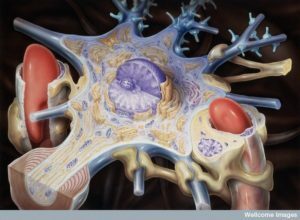 Pericytes sit between the lining epithelial cells and astrocytes that cover the blood vessels and neurons. Pericytes are very active in multiple brain functions helping regulate the blood brain barrier and its changing permeability, creation of new blood vessels, modulation of neuro inflammation, clearance of toxins and stimulation of stem cells. 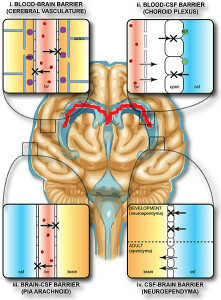 There are four barriers in brain tissues—blood brain barrier, blood cerebrospinal fluid (CSF) barrier and two barriers of brain tissue and CSF (at Pia-Arachnoid and appendyma). Previous posts described choroid cells that determine the barrier between the blood and cerebrospinal fluid. It determines what immune cells, molecules and microbes enter brain fluid. It also regulates transport of energy molecules, nutrients, ions as well getting rid of toxins. The blood brain barrier surrounds all blood vessels going going into the brain with very tight junctions of endothelial cells (capillaries). These have no fenestrations and pericytes are critical to maintain this barrier. Genetic defects in pericytes cause neurological disease. Breakdown of BBB and pericytes occurs in Alzheimer’s. This breakdown can also increase tumors with more blood vessels. Pericytes contraction is based on a very unusual cytoskeleton—with unique molecules vimentin, desmin, myosin and nestin. They have many unique membrane molecules as well NG2, PDGFRbeta, CD13, regulator of G protein 5 (RGS5) and MUC18. Pericytes come in different varieties, one for pre capillary arterioles, thin strand helical types on capillaries, and mesh types with stellate shape on venules. Blood Brain Barrier: With very tight junctions between cells that line the blood vessels, pericytes, capillaries and astrocytes all participate in regulating what crosses the blood brain barrier. This occurs at every blood vessel in the brain. Vesicles filled with fluid and molecules cross with permission. Making New Blood Vessels: When the brain is being built in the fetus, pericytes stabilize blood vessel structures and help determine where new vessels go. Clearance: Surprisingly, pericytes behave like macrophages and eat debris and proteins. They are involved in attempting to rid Alzheimer brains of amyloid toxic materials. Blood Flow: Regulating blood flow in the brain is extremely important. Similar to other vital functions, there are redundant mechanisms working together with feedback for safety. It is well known that astrocytes open and close vessels for neuronal oxygen needs. 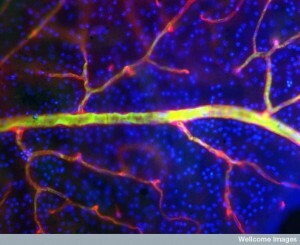 Both capillaries and pericytes work together to help the astrocytes regulate the size of the blood vessel. Pericytes determine the diameter of the capillary and the tone of the small vessel from communication with astrocytes. Becoming Stem cells: Pericytes are very talented cells and can become stem cells for both blood vessel cells and for brain cells. Defective pericytes contribute to ALS, diabetes small blood vessel damage, HIV dementia, epilepsy, and other micro infarct diseases. There are many complex names for the receptors in the family of PDGF or platelet derived growth factor. Specific versions of molecules are secreted by capillary lining cells and picked up by pericyte receptors. In fact, there is a concentration gradient of these signaling molecules between the cells. Signaling is highly regulated with many complex pathways, factors and kinase enzymes. Signals from the capillary cells stimulate survival and growth of the pericytes. 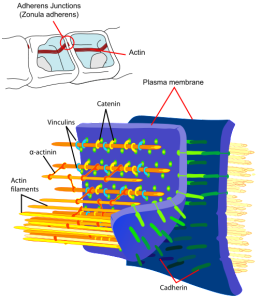 They also stimulate movement of pericytes into position and attachment to the vessel wall. Lining cells and pericytes are from different lineages. Pericytes are connected to muscle cells and other tissue cells like fibroblasts. They have ability to contract and hold the vessel in different shapes. These two different lineage cells have elaborate communication to help each other’s functions. Signaling produces stimulation for movement, contraction and other functions. There is reason to believe that pericytes have different capacities in different periods of life. For example, in aging, they have much more work to do to clear mis folded proteins at the blood brain barrier. In the eye of a patient with diabetes, signaling is disturbed and pericytes die causing more micro strokes and more tumors. Inflammation is altered by signaling to immune cells that can bring more macrophages and leukocytes into the brain. TGF Pathway: A complex set of signals triggers TGF-β cytokine in both of the two cells. One of them increases the number of pericytes. This same pathway is involved in signaling the type of cell pericytes should change into. Pericytes can become muscle cells, fat cells and even structural fibroblasts. Signals tell them where to travel and where to attach to vessel lining cells. They are instructed on the level of tightness of the blood brain barrier. Another set of similar cytokine signals and receptors TGF-b–TGFbR2 are related to hemorrhage in the ventricles of the brain (interventricular hemorrhage or IVH). This causes infant death from genetic deficit of pericytes. Another malformation in the brain has small vessels that look like raspberries. These have extra large lining cells with unusual vesicles and poor junctions. This same signaling pathway can stimulate aggressive cancers of glial cells. Glial cells are stimulated excessively by the pericytes. When strokes appear, this communication is vital for repair work. The signals stabilize small vessels as they develop. Notch Pathway: Another pathway that is triggered (Notch) helps sprout new small vessels and can remodel the vascular system. Special capillary cells lead the growth of the new small vessel and this is signaled by a gradient of molecules between the two cells. Notch signaling appears to be vital to maintain the proper blood brain barrier, along with TGF-beta. It is remarkable that signals of this type in cancers alter the cancer cell that then differentiates into a pericyte type cell with smooth muscle activity to make more vessels. VEGF Pathway: An entirely different signal pathway VEGF-A and VEGFR2 signals both pericytes and lining cells in different ways. Many complex pathways of this type are connected to the vital Bcl factors that maintain survival in both cells. These pathways are involved in survival of the cells, altering the junctions of the cells for the blood brain barrier and making new blood vessels. After damage from lack of oxygen (hypoxia or stroke), pericytes travel away from capillary cells. This movement is designed to stabilize the tight junctions in some of the areas and kill the lining cells where there is irreparable damage. Once again this complex set of cascading chemicals stabilizes some of the cells, allows others to shift to survive without oxygen (anerobic metabolism), kills some of the cells and makes many more cells to rebuild. This same pathway is taken over by some cancers to make more blood vessels. This altered pathway helps promote maturation of more cancer cells and enlarging the cancer. ANG-Tie2 Pathway: Pericytes use this signal to activate more blood vessels. 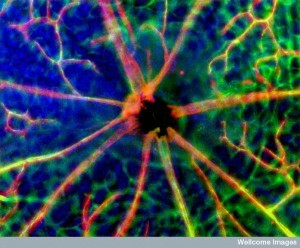 This set of complex signals make endothelial lining cells move to make more sprouted blood vessels. Without these signals new vessels don’t appear. Too much of this signal creates excessive blood vessels that can be a problem. It is also vital in making the endothelial cells permeable. MFSD2A Pathway: This pathway is related to signals that determine which fatty acids are transported across the blood brain barrier into the brain. One example is DHA, an omega 3 fatty acid. Pericytes are needed for these transport systems to work. It is also critical for maintain the function of the blood brain barrier. Without this pathway, mice and humans have microcephaly. Ephrin-Eph Pathway: These receptors and signals provide instructions for cells to keep tight contact cell to cell. When vessels are being set up in the fetus, these are vital for proper connections. They give direction for pericytes movement and where they will attach. Later, they continue to be involved in new blood vessel formation. There are a variety of other newly discovered signals that are also necessary for cells to attach to each other while blood vessels are made. Alzheimer’s: One disease of pericytes is called Fahr’s disease and includes migraine, motor tremors, changes in mood and cognition. This involves genetic changes that don’t allow these signals. This same pathway is disturbed in Alzheimer’s where soluble receptor proteins are found in the CSF. When this conversation is disrupted many problems arise that are related to Alzheimer’s. One of them is decreased clearance of amyloid toxic material. This also leads to increased tau pathology. It is not clear if these two independent processes are directly related to Alzheimer disease pathology, but they worsen it for sure. 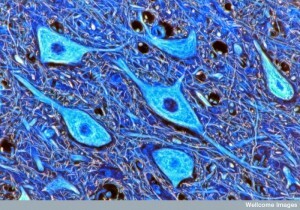 In Alzheimer’s, along with other cells, pericytes are destroyed. 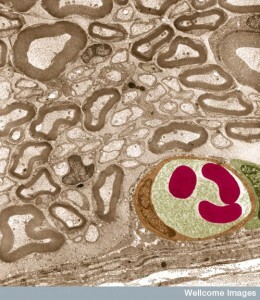 Another pericyte mechanism might be related to Alzheimer’s disease. Pericytes are involved in the metabolism for recycling of proteins and disabling damaged proteins. One of the proteins involved is APP (amyloid precursor protein), which is involved in Alzheimer’s. In a rare genetic cause of early onset Alzheimer’s, with mutations in a particular gene (presenilin 1), there are alterations in the receptors for this conversation. Several other mutations in other genes lead to breakdown of blood vessels and brain hemorrhages. ALS – Amyotrophic Lateral Sclerosis : Changes occur in the small brain vessels of one type of ALS (amyotrophic lateral sclerosis). Pericytes deteriorate and blood brain barrier breaks down, also the blood spinal cord barrier (BSCB) near the neurons that go to muscles from the cortex and through the spinal cord. Studies show pericyte disruption is before the neuronal symptoms. This has not been proven for the main genetic cause. Diabetes: In type 2 diabetes, pericytes explode with apoptosis and help to cause the problems in small blood vessels that determine blindness. HIV Dementia: This dementia involves loss of pericytes and dysfunction at the blood brain barrier. 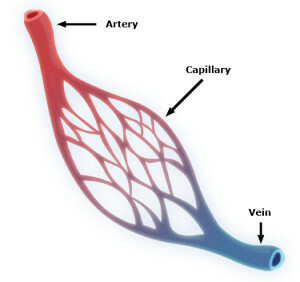 There is a similar breakdown in communication between the capillary cell and the pericyte. Cancer: Pericytes are involved in helping cancers increase the number of blood vessels. The same signaling pathways are involved in increased cancer cells and blood vessels in medulloblastomas. 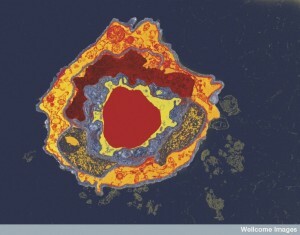 Cancer cells of various types can turn into pericytes and then grown their own new blood vessels. Recent research has begun to study complex communication between pericytes and astrocytes as they control the vessels and blood flow together. CypA-NFkB-MMP-9 is a pathway related to apo lipoprotein E (APOE) that is secreted by astrocytes and triggers pericytes related to blood brain barrier activity related to inflammation. APOE4 has a negative effect on the blood brain barrier including decreased function of the basement membrane and tight junctions. This causes more amyloid and other toxic molecules to accumulate and is related to Alzheimer’s. Studies show that APOE4 gene is a major risk factor for Alzheimer’s and is probably related to this signaling. Another pathway related to fatty acids is the arachidonic pathway. These signals are from astrocytes to pericytes and regulate tone and size of the capillary as pericytes contract to control the vessels size and blood flow. Arachidonic acid in astrocytes becomes prostaglandin E2 (PGE2) by an enzyme cyclooxtgenase 1. Pericyte receptors are triggered causing contraction. CA2 Calmodulin-Mysosin Pathway: Calcium channels regulate intracellular and extra cellular calcium levels. These levels can cause pericytes to contract. Neurons connect with pericytes that cover blood capillaries in the brain. While neurons are in constant contact with astrocytes and other cells related to their needs, pericytes and astrocytes control neuron’s blood flow and its energy and nutrients. Neurons are ten times closer to capillaries than arterioles and that is where most of the neuron’s signals will diffuse. Pericytes secrete neurotrophic factors to support neurons, but much less than astrocytes. Some signals, however, only come from pericytes not astrocytes so this signaling is also crucial. One example is the effect of insulin in the hypothalamus, where pericyte signaling is more important. Pericyte signals to neurons can occur via the cerebrospinal fluid and local flow between cells. Norepinephrine stimulates pericytes to contract and close capillaries diameter. GABA relaxes them and does the opposite. Other neurotransmitters that relax pericytes include glutamate, dopamine and adenosine. Glutamate works in the PGE2 arachidonic pathway. Neurons through these various pathways control capillaries circulation because capillaries dilate before arterioles. The complex regulation of the Neuro Vascular Unit and blood brain barrier involves many different factors and signals. It is similar to the large synapses including immune cells related to chronic pain and inflammation. Signaling includes more than described here. Immune cells are involved as well in the neuro vascular unit, but this research is just beginning. All barriers of the brain are somehow coordinated including the blood brain barrier from pericytes, astrocytes and capillaries; the brain CSF barrier; and the blood-CSF barrier with choroid cells. There are six families of pathways for the very complex signaling between the pericytes and the capillaries. These can cause microcephaly, CCM, IVH, ischemia and stroke and cancer, diabetes retinopathy, and ALS. There are three large pathway families from pericytes and astrocytes. Neuronal pathways are just being worked out. The new discovery of the significant communication of pericytes to all other brain cells adds another large dimension in the cellular conversations of the brain. Pericytes are vital to many very important brain functions and have very elaborate signaling with capillary cells, astrocytes, neurons and other glia. The details are just now emerging. Very important functions of this signaling includes all passage of cells and materials at the blood brain barriers and blood flow to specific neuronal regions. Neuro Vascular Unit signaling appears to have multiple layers between many cells including all glia, blood vessel cells, and immune cells. This entry was posted in Blog, Neuronal Plasticity, Cellular Intelligence, Human Brain and tagged Pericytes control brain blood flow, pericytes control blood brain barrier, pericytes can become stem cells, Pericytes are contractile, Pericytes talk with capillaries, pericytes talk with astrocytes. Bookmark the permalink. Isn’t it possible, if not probable, that the assignment of different duties to deliberately selected cells has been the cause of their different physical properties that have allowed them to carry out these necessarily different duties while all must use the same means of communication and essentially the same language or languages in doing so? In other words do their selected purposes play a direct role in evolving their functional capacities, rather than their capacities having led to the selection of the purposes they will serve? The question remaining still being whether randomness plays a causative role in the initial selection process or is it the process itself that has purposefully used randomness to produce the most useful results? To complicate my questioning even more, wouldn’t it then be the necessary case that each cell must at some point reconstruct its own form to fit its purposes, whether those purposes were self selected or other selected, or some combination of both? If randomness plays any causative role in any biochemical function I have yet to see a hint of it. Yes, I would say that cells must construct their form to fit a need. Of course, that cells can change from one cell type to another has been known since we first learned that we are made of cells. The question of HOW has always been the tough one. What we are learning now is that there is extensive communication going on before differentiation. As he laid out well in the article, different chemical pathways cause specific outcomes, both in health and in disease. I think we can rule out randomness, since we have specific cause and effects known. The question is whether or not the chemicals cause the change through unavoidable chemistry or if this is just a cell’s way of becoming cognizant of its needs. I lean heavily toward the latter, because the former should be readily identifiable, at least in a few cases. No cellular systems of biological creatures would have needed to evolve at all if not for the need to deal with the random changes that regularly occur in these environments, and this includes the changes selectively made by each environment’s biological competitors. And by the way, biological intelligence uses chemicals to fulfill its purposes and not the other way around. OK, if you are talking about factors external to the organism, there obviously is randomness. They’re not external when they are regularly predictable forces or factors that the organism must be prepared to react to.